Oh Disney, where did this go so wrong? You have such talent available at your finger tips, such vision, huge resources, and this is the best you can do? A disjointed, mess of a movie, with a story line that only “clicks” about 10 minutes from the end, and I say click barely. I actually don’t know how to describe the storyline, because I am still unsure myself what it was all about. I believe there is some morality or warning about what will happen if we don’t get our act together and do something about climate change. But I could be mistaken. 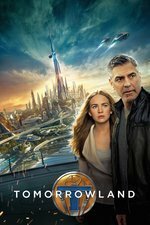 George Clooney takes on the role of Frank Walker, a young inventor who tries to impress at the 1964 World Fair with his jetpack that doesn’t quite work. Disheartened and rejected, Athena (Raffey Cassidy) see’s hope in him and shows him a world of such futuristic technology he is amazed. Here is where we start to get off the rails quickly. We have robots as humans, and robots as well, robots. We have time travel thrown in, jetting back and forth between the present and the future. The movie is a complete disaster. Britt Robertson (from Under the Dome) is the modern day hopeful that seeks out the older Frank Walker to help her understand what is going on. We are truly behind Britt in this quest, because the audience is equally as clueless as to what is going on. Tim McGraw pops up (yes the country singer) as her NASA engineer father who is her complete inspiration, and in his defense, he like us, has no real clue what is going on. You may think he is acting, but I think this is truly genuine. 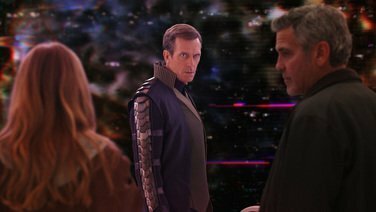 Hugh Laurie) is our token bad guy, except he isn’t, or is he? Is just misunderstood? I don’t know. I don’t care! And there in lies the problem with this one, you really don’t care what is going with this story. There is no character loyalty built up. Now with all that said, the movie looks spectacular. The sets are beautiful and quality and attention to detail is as you would expect from this level of Disney investment ($190M). For those fans and familiar with DisneyLand and DisneyWorld will enjoy the references, complete with tunes from some of the famous rides. I may never sit in the Its a Small World ride in the same way ever again. This could have been such a great movie and re-watching the trailer I see where I was sold a bill of goods.